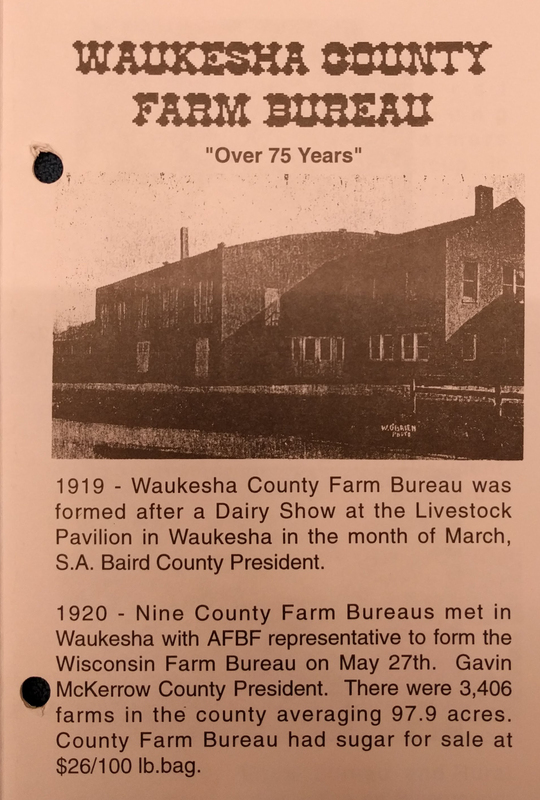 Waukesha County Farm Bureau’s claim to fame is that it was the first county Farm Bureau in the state of Wisconsin. first signature for the Waukesha County Farm Bureau’s charter. This was not something I learned until the late 1970s when I was serving as Wisconsin’s Young Farmer and Rancher Chairman. Looking back and seeing the roots of my family so intertwined with Farm Bureau’s gives me a sense of great pride. My father served on the Waukesha County Farm Bureau board as both a director and eventually their president from 1976-1982. Growing up with a very active Farm Bureau family, I didn’t realize how different my perspective was looking at the organization as whole. When WFBF first rolled out the director of local affairs position, I wasn’t fully on board with it. I couldn’t understand why it was needed. Growing up within the Farm Bureau organization, it was common for me to see our family highlighted three to four times a year on various tv reports. We once had a U.S. senator milk his first cow on National Ag Day on our farm. It was ingrained in my family that our barn doors were always open for various agriculture promotion activities or programs. We hosted numerous classroom tours and attended career days to share all that we did. It was just expected of us to share our agricultural story with the general public. We hosted a variety of public events at barns, ice cream socials, farm displays in malls and Ag Day at Zoo. Today, I can see the value in the program. With less and less of us to share our story it is critical to make sure our township, school, county and state officials understand what we do. This is something that we can now do more efficiently with having a director of local affairs. When I began to take on more responsibility on the farm, my involvement within Farm Bureau also increased. Over my 50 years of involvement I always tried to answer the call when needed. For me, it was just the right thing to do. I have spent my share of time at the Capitol testifying at state hearings, advocating for use value assessment of farmland and other key issues. It was during my tenure with the Waukesha County Farm Bureau that they were hosting a series of workshops on the Farmland Preservation Law. After one of the workshops, a group of farmers started discussing land taxes. They discovered that one of the townships was assessing farm land way over what the farmer-to-farmer sales were. 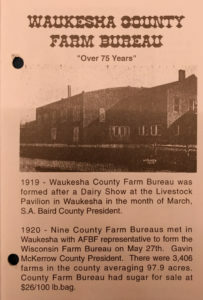 Waukesha County Farm Bureau then organized a meeting with the farmers of that township and devised a plan of action. It was then that 18 farmers rallied together to hire a lawyer and go to bat for how their land was assessed. At the time they were paying $45-50 an acre in property taxes compared to the now $3.25/acre. This is a prime example of grassroots action, how something at a county level can lead to big wins for farmers across the state. In today’s fast paced world, it is reassuring to know that these parking lot conversations are still happening. That the heartbeat of our organization is still focused on local issues. I encourage you or your county Farm Bureau to reach out to the director of local affairs and talk about the challenges you are facing and the best course of action to take. Who knows maybe the issues facing you or your county might be the next big win for Wisconsin farmers like it was in Waukesha almost 30 years ago. 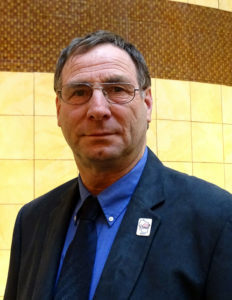 Rob Klussendorf became a member of the Waukesha County Farm Bureau in 1968. He served as on the Young Farmer Committee from 18977-1980 and was elected chair of the committee in his last year. Over the past several years, Rob has been active on numerous WFBF committees including, Tax and Education, Volunteers for Agriculture and Policy Development. Rob also served on the Muckwonago School Board from 1989-2007. Today, he resides in Taylor County where his son owns a dairy farm.